Above: With her daughter, Zoe, and Mersina. 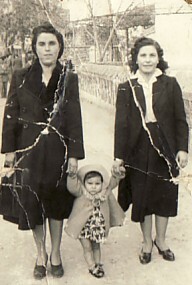 Above Right: Holding her grandchild, Iraklis Malamas, his godfather Iraklis Malamas and her son-in-law, Periklis Malamas is in the background. Above: With her husband, Dimitrios.